Home > Travel with me > Photos that will make you wish you were in Hoi An right now! Hoi An is just one of those beautiful cities that makes you smile. If you are planning a trip here, check out my comprehensive guide on Hoi An. 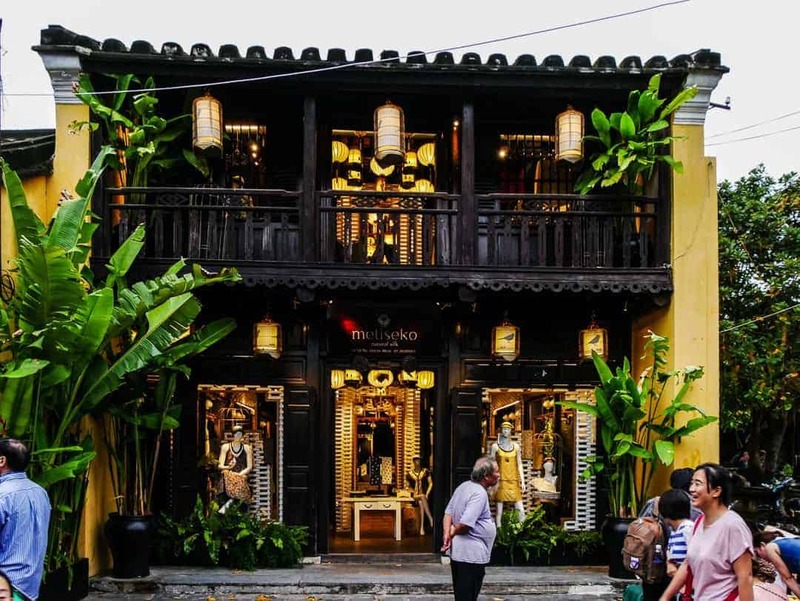 If, however, after reading it, you still need convincing, these photos will surely give you some of the best reasons to visit Hoi An. I could look at these over and over again and picture myself right back there. We flew to Hoi An from Ho Chi Minh City via Viet Jet. You can read a review of this airline below. 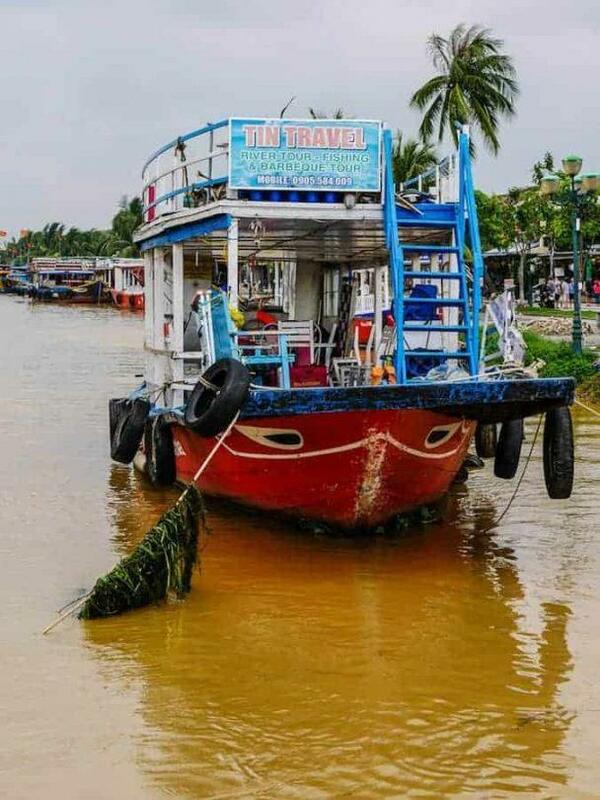 Hoi An is all about the river. Its history is tied to the proximity of the river and the open sea. Today, the river remains a lifeblood to this town. Almost level with the streets, the river can send water flooding into the laneways and buildings. Ever since we spent time on the Mekong Delta I have been fascinated by the eyes on the boats. Local legend has it that the eyes protected those on board the boats from evil spirits and also brought them back safely to shore. Now, when I look at these boats, all I see are their eyes, as though they are watching my every move. Creepy or reassuring? You make your mind up. The river is used constantly, and whilst not a main thoroughfare, many of the boats here provide locals with their means of making a living. Fresh food is important to the Vietnamese and the markets are an integral part of this. 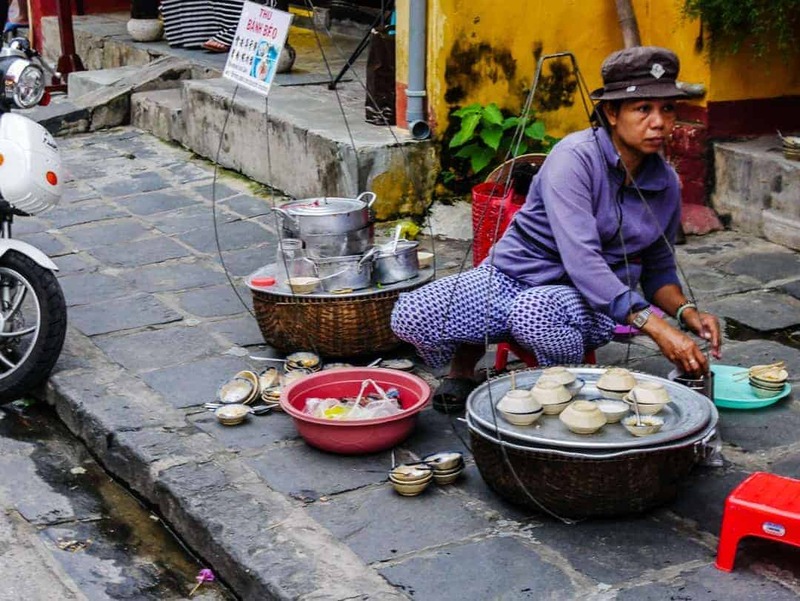 (Mainly) women in Hoi An, establish themselves in key locations around the markets to sell their produce. It’s always presented beautifully here, although it still takes a bit of getting used to seeing it sit directly on the road at times. The woman below is quite professional, with her baskets, and layers of paper underneath the vegetables. This street vendor carries her ready-made broth and mini kitchen around on a pole on her shoulders. When she finds an opportunity to sit down, she takes the pole off and continues to cook and serve from the footpath. Every interaction, every photo of people tells a story. The Vietnamese people of Hoi An live very simple lives and it’s wonderful to just be able to take the time to sit back and watch them. It’s very normal to find animals walking in amongst the people here in Hoi An. Resilience isn’t just a trait of the Vietnamese. It’s also inherent in the animals. There’s nothing that shows off resilience more than a chicken hanging around a food market where their friends are now someone’s dinner ! The scene playing out in this photo had me watching it for ages. The lady had a bird cage that she brought out onto the street, opening the door for her bird. Can you see it walking on the road? the bird walked around the street, pecking here and there, and deftly avoiding foot and bike traffic. When she’d had enough (the woman that is), she called the bird and it walked back to the cage. These things might not seem out of the ordinary to those who live here, but to a city slicker from a western country, it’s heart warming to watch. Whatever you call them, they are everywhere here. Two and three wheelers too! Hoi An is a flat town and an easy one to traverse, so bikes are the perfect choice. There are no speeding cars and relatively few motorbikes in the town so it also feels like a safer place to ride. I developed quite an interest in them, hence why their photos frequent my Instagram page too. I watched the rider of this particular bike pull up to the fence, take out her washing from her front basket and proceed to hang it all out on the fence. Providing a source of income to those who push them around the streets, they are also a method of transporting their belongings around the city. Taking a slow walk around the back streets is less touristy and where much of the “real” Hoi An can be seen. Always friendly, the locals will call out to you and wave as you pass by. The Vietnamese are masters at fixing things too! Often it looks like they have pieces of string and rubber bands, and spare parts from a lifetime of pulling motorbikes or other appliances apart. Their workshops look like a veritable treasure trove of “stuff” but they give you the impression they could fix anything. These kids came out of a school and went straight to the food vendor. The culture of street food starts early in this country. Hanging from trees, outside buildings, in markets, or even small hand held ones, lanterns hold a special place in Hoi An. There’s always someone smiling here, and it’s part of the warmth this city exudes. A mix of cultures create the blend of building styles here. From pagoda like rooflines, to tin roofs, to concrete and wood buildings, they all come together to define Hoi An. Colour is a theme that runs throughout, and the display of lanterns that adorn them at night make them shine. Think about the season. Monsoon season can create issues in this low level town. Flooding is common and depending on the length of your stay, could impact your travels. Also remember that Hoi An is in Central Vietnam so the wet season is different to that of Ho Chi Minh City and Hanoi. Nearby locations of Hue and Da Nang are also worthy of a visit if you can fit it into your itinerary. Try to spend at least a few days here. There’s heaps to do in and around the area. In peak season, cooking classes and food tours book up quickly. Don’t turn up and expect to find a place – book in advance. Thank you for this! We’re arriving in Hoi An in a few days and may sty 3 months. Our last visit was 17 years ago. Great to see it’s not changed much. Can’t wait!! Wow how amazing Alyson that you might stay 3 months here. I could seriously imagine doing that, so much to just soak up. Come back and tell me what you think it’s like all these years later.